Father’s Day is fast approaching, and I’ve been racking my brain as to how I could spoil the special dad in our home. Like me, he’s a geek, and so finding that little special something that he can enjoy year-round is a challenge, but one I gladly will take on to show him much we love him. When I first started looking around I saw a lot of awesome goodies that I knew he would love, and so I decided to share them with you because I can’t be the only one married to a geek now, can I? 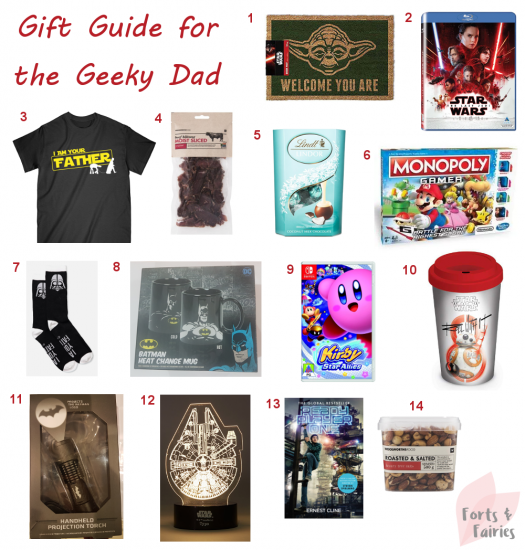 I hope they give you some geeky inspiration for spoiling the dad to your own special kiddies, and that if you find something equally as awesome you’ll share it with me! Star Wars has always been a big deal in our home, and so the new Star Wars: The Last Jedi was top of the list for movie night. There are also a few other totally cool Star Wars themed goodies I found that are on my Father’s Day list too. Friday is casual day at hubby’s work and what better what to make his day than with an awesome Star Wars T-shirt that celebrates being a dad too, win-win. You can also kit him out with these fun Darth Vader ‘I am your father’ socks (heavy breathing and deep voice mandatory for every time he wears them) and I also love this BB-8 ‘Roll with It’ travel mug. Finish the look with this cool mini light of the Millennium Falcon for his desk and be prepared to accept that Wife of the Year award. If you’re all in you can even get this ‘Welcome you are’ Yoda mat for your front door to surprise him. Best wife ever you will be! Man caves (or batcaves) are sacred, so make sure you check out this cool colour-changing Batman mug and Batman handheld projection torch to help light up his life. You should also make sure he has a balanced life with an awesome new book and videogame to enjoy. Ready Player One is a great book choice, and Kirby: Star Allies is a fun game for the Nintendo Switch (bonus points that you can all enjoy it together as a family). Monopoly Gamer is a fantastic boardgame for the geek dad in your life, it has a Nintendo twist so you’ll be able to play as Mario, Princess Peach, Yoshi or Donkey Kong as you buy properties, collect coins and beat bosses. We all know that the way to a man’s heart is through his stomach, so be sure to keep Dad happy this Father’s Day with a few delicious spoils. Top of my list is the new Lindt Coconut Chocolates (best enjoyed after kiddies bedtime so he doesn’t have to share, except with you of course), and I find that gaming time is always bolstered by a few snacks like tasty nuts and biltong. Pair your goodies with a special handmade ‘Yoda Best, love you I do’ card by the little ones and you’re guaranteed to have a very happy geek dad! Oh I love it, we have discussed Dads fathers day Gift in great length as Dad started a new Job so he has to travel an extra 100km a day, so this year we have collected Anti Glare glasses, a hands free car kit with car charger and a snazzy little windscreen cleaner that gets to all those hard to reach places. The kids have planned him a breakfast of pancakes and bacon and we will serve him in bed. Thanx so much for the brilliant ideas appreciate your blog! !